As a Colorado based wedding, elopement and engagement photographer with 7 years of experience, I've had the pleasure of shooting at many of the ridiculously beautiful areas this state has to offer - a lot of them located right outside of Denver! I feel like us front range folks are extremely spoiled, given that there are some epic hikes with grande vistas as close as 35 minutes away (or less), which is what I'm aiming to share with you all. Of course, this is just the tip of the iceberg - there are literally a million other spots that would make for some great engagement photos, but these are some of my favorites! Well if you haven't heard of Red Rocks it's because you haven't been to a concert there, or you live under a rock, both of which need to be remedied ASAP! Red Rocks has a ton of really great areas for engagement photos, family photos, couples sessions, you name it. There are spots where you can just pull of the street and hop out for a quick photo op, or you can hike one of the many trails they have through out the park for a more off the beaten path experience! 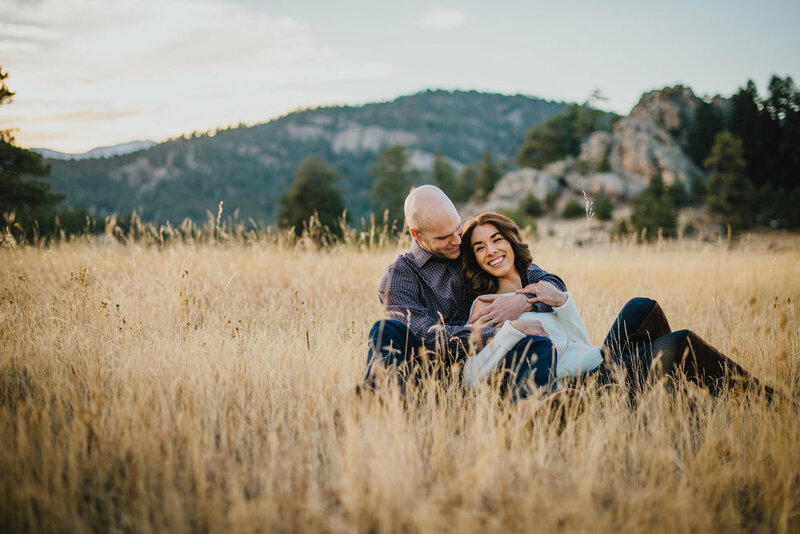 Chautauqua is an amazing spot for adventurous engagement photos, given that in most of your photos you'll have the flatirons jutting out in the background in all their slanted sandstone glory. One thing I always recommend is for clients to opt for a sunrise session here, as it can get so crowded people end up having to park at the high school down the street. It can be a little bit of an uphill trek as you venture towards the first and second flatiron, but it's short and totally worth it! If you don't feel like leaving Denver at all, period, and are hoping for more of a city feel, then Rino is a great choice for you. The mural above no longer exists, but it was replaced by an even funkier one, which is kind of the beauty of this area - it's constantly changing and surprising me! I recommend parking somewhere Larimer and 27th and just walking around - definitely make sure to dip into all the alleys! If you are located in Colorado Springs, then this gem is in your neck of the woods. It's not a terrible drive from Denver, and if you're like me you could kill two birds with one stone and check out the outlets in Castle Rock on your way there or on the way back! This is another Boulder gem and so worth the views! The perks to this spot are endless - great vistas of both the city and the mountains, 35 minutes away from Denver, and you can seriously pull right up to this spot - there's very minimal hiking involved. In fact, it's more like...light rock scrambling. The cons? During the summer, forget about having an engagement session here in the late afternoon - it's crawling with people. Another con is that it's almost always windy, which can make for some great intimate engagement photos, but can also cause some crazy hair and wardrobe malfunctions. I personally love the wind and think it just makes for a fun session overall. My personal recommendation? Shoot here in the early morning to avoid crazy weather and peeping toms! I'm cheating a little here, as the photo above is actually an elopement and not an engagement session, but you get the idea. This hike was one of my FAVORITES to do while I was pregnant with my daughter, Luna. It's an out and back hike to Panorama Point, and although it's short (a little over 2 miles), it's steep, especially when getting close to the top. It can also be a bit confusing, for a couple of reasons. The first is because there are two entrances to this park - a lot of folks will hit up the first Corwina entrance off highway 74, but it's actually the second if you want a shorter, more direct route. Another reason is because at one point, the trail intersects with a biking trail from Lair O' The Bear, so some hikers can get confused, but eventually you come to a T in the trail and you realize that if you want to see some views, you'll have work a little harder and hike up. Aren't afraid of sweating and up for a challenge that's worth it? Contact me to schedule a shoot! I love this park so much I had my own wedding photos taken here. There are 15 miles of trails, all ranging in different levels of difficulty, with beautiful rolling hills and rock outcroppings everywhere you turn. I recommend starting in the second parking lot, or the west trailhead, as it provides a more direct route to some beautiful meadows and epic views! This was a more recent discovery of mine, thanks to a client, and I'm so glad I shot here! If you are looking for wildflowers for your engagement session, but don't want to drive all the way into the mountains, this is the spot. I shot here last July and the flowers were in full bloom. What's nice about this hike is that if you want to stay near the trailhead, you definitely can and still get some phenomenal shots. On the other hand, if you are feeling adventurous, you can hike the Sanitas Valley Loop Trail (which is a little over 3 miles) and have a hand at capturing some gorgeous vistas at the top for your clients. Be warned though, it is a pretty steep loop, so bring water and stay hydrated! So Kenosha is a little further from Denver than the other locations in this post, but it's so worth it - especially in the fall! The leaves here start changing early to mid September and it's so incredibly gorgeous and worth the drive. Interested in having your engagement session in one of these spots? Don't hesitate to reach out!